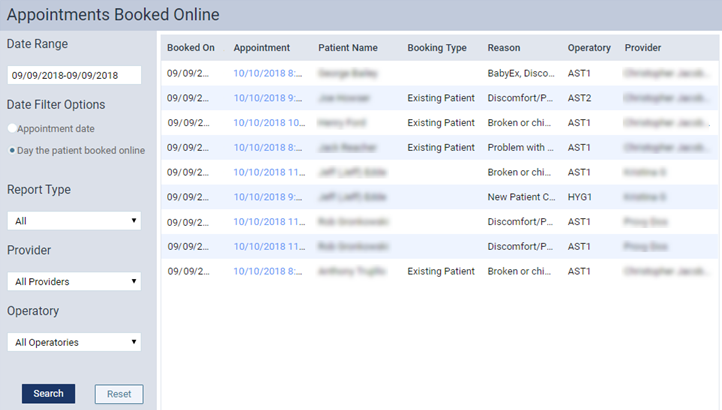 The Appointments Booked Online Report displays that appointments that were booked online by patients within or for a specified date range. On the Schedule menu, click (or tap) Appointments Booked Online. The Appointments Booked Online page opens. Date Range - According to the selected Date Filter Options, includes appointments that were booked online for a date that is within the specified date range or that were booked online on a date that is within the specified date range. The default range is the past 30 days. Date Filter Options - With Appointment date selected, includes appointments that were booked online for a date that is within the specified Date Range. 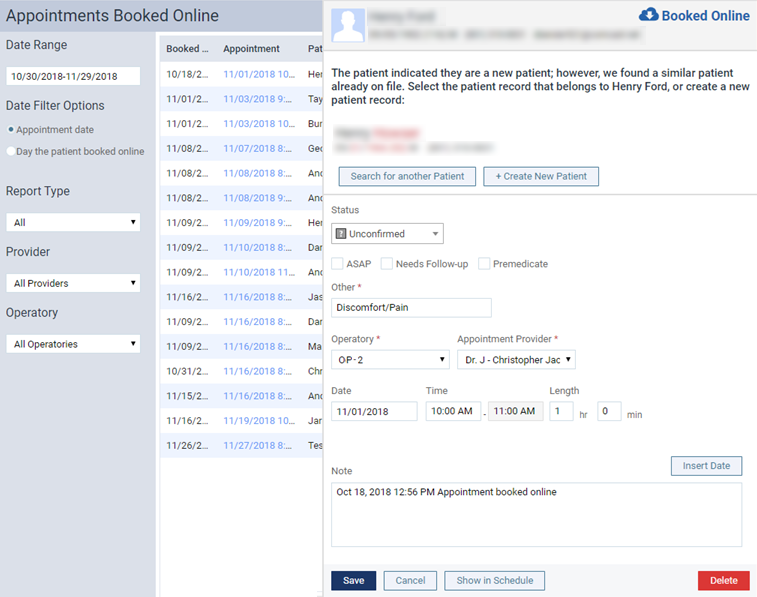 With Day the patient booked online selected, includes appointments that were booked online on a date that is within the specified Date Range. Report Type - Includes appointments for All booking types, for only Existing Patients, for only New Patients, for only Recare, or for only Unassigned Bookings. Provider - Includes appointments for All Providers or a specific provider. Operatory - Includes appointments in All Operatories or a specific operatory. Tip: You can click (or tap) any of the Appointment links to view the Appointment Information panel for the corresponding appointment and make any necessary changes without having to leave the report and go to the Calendar page.